Boulder City, Nevada is now the home of America's largest photovoltaic solar plant — and it's the fifth largest in the world, in fact. It's all part of California's plan to generate 20% of its power from renewable sources by the end of this year. Wait, California? Yeah, that's right — in your face, Nevada! The Copper Mountain Solar Facility was started at the beginning of this year and constructed was completed earlier this month. It's already generating power, to boot, and the 775,000-panel plant is rated to produce a max of 48 megawatts of electricity across its 380 acre field. There's only two similar installations that produce more power in the United States: the Solar Energy Generating Systems facility — which produces more power than any other facility of its kind in the world and consists of nine solar power plants — and Nevada Solar One, a solar thermal power plant. 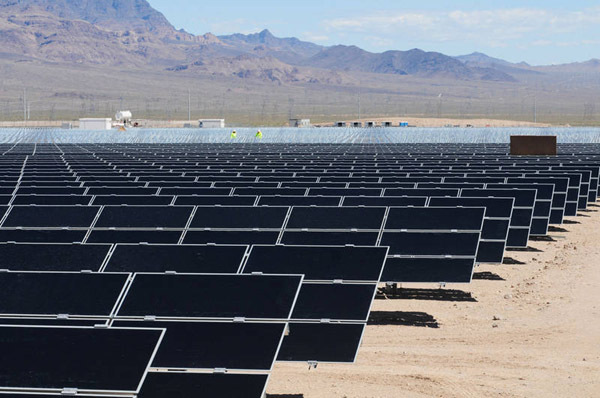 California has solar power interests across its own state as well as Nevada and Arizona, and the Copper Mountain Solar Facility, as well as its neighbor the El Dorado Solar Power Plant, are on lease to a San Fransisco-based power company for a good 20 years. 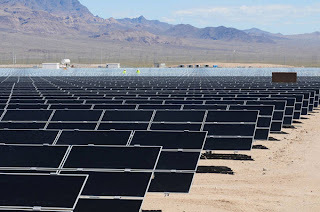 The huge desert expanses of the states make them ideal candidates for solar energy, and they share a common goal in producing a respectable fraction of their energy using renewable sources.